Just west of where the vast Mediterranean Sea pockets itself into the southern Turkey border lies the Beydağları Coastal National Park. The park is home to the Olympos Aerial Tram. The tram lifts you up to the 2,365-meter peak of Mount Olympos were you can witness the sublime in its 360-degree panoramic view of the Mediterranean and the mountains of southern Turkey. This majestic range of mountains runs eighty kilometers up from the southern city of Cape Gelidonya. Looking west from this summit one can see Turkey’s eighth largest city, Antalya. 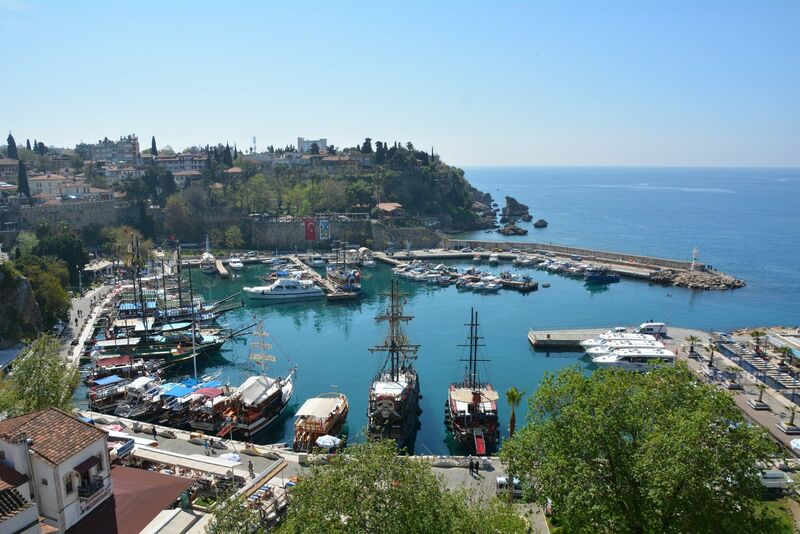 An international tourism destination, Antalya is a city of national wonders and contrasts. The city pivots on one of its oldest monuments, Hadrian's Gate or Üçkapılar, just a few kilometers in from where the city’s shoreline dips south. Erected in AD 130, it is one of the city’s oldest surviving monuments. The gate consists of three arches almost 12 meters in height, and, when visited a few times, it becomes like a living Monet painting - it becomes kinetic, constantly changing as the light changes, appearing bleached or vibrating cords of gray depending on where the sun hangs over it. A small section of the city, Antalya’s Şirinyalı district, almost parallels the grand vista. This district houses a few large hotels that are nestled right on the city shoreline. Included in the city are many large-scale hotel complexes that sit along the shoreline like cruise ships. Completely self-contained, you could spend weeks exploring the shops, spas, pools, and restaurants, and never suffer a second of boredom in these refined worlds. As the view from the patios of Beydağları Coastal National Park is painted with a range of blurred blues in the morning light, the mountains shift to purple and the waters to deep blue right before the dusk in the late afternoon. During the evening, the lights across the bay flicker like a static flock of birds. A view from the balcony of any of these hotels rivals the majesty of any in the world. Outside of these large complexes, the city seems much more like a suburb. The roads are lined with eight-story flats and restaurants where most of the dining areas are set under retractable roofs and open windows. The district’s main artery is Metin Kasapoğlu Caddesi, which turns into İsmet Gökşen Caddesi. Except for the banana and palm trees that line the boulevard, the street looks like one you would find in the outer districts of Izmir, Ankara or Istanbul. The two roads meet at a rotary in front of one of the city’s massive hotels. This is in the middle of about a kilometer-long strip of restaurants, most of which are built up around large patio spaces and a central hub. The retractable roofs and folding walls create a sense of dining in the open air. You can get everything from a double shot, decaf mocha latte to a dish of İskender döner. This dish contains thinly sliced lamb laid on a bed of pita bread, covered with yogurt and tomato sauce, all bathed in hot melted butter. The city also contains many yörük tents which serve as cafés that echo Turkey’s nomadic past. In these tents you can enjoy traditional Turkish delicacies like sac kavurma, diced lamb served in a skillet with chopped tomatoes, peppers and onions. Sac gözleme, a thin flatbread often stuffed with parsley, spinach, and white cheese can serve as a meal or just a late night snack. All of these dishes pair well with ayran, a mixture of yogurt, cold water and salt. Another natural beauty roughly parallels Antalya’s eastern shore. Two magnificent waterfalls, the upper and lower Düden Waterfalls, sourced from the Kırkgözler and Pınarbaşı in the northern Taurus Mountains mark Antalya’s western border. An underground waterway carves its way from the mountains to the coast eventually spilling out into the sea. Visiting the lower Düden falls is a special treat. This is a park located in the west suburb of Lara. Walking through the gates, the park seems like the ideal place to picnic beneath a canopy of trees. As you walk through the park, you come to a section where the water-way is exposed, taking you within a few meters of the rushing waters. In this moment you experience Antalya’s true magic. Come visit Antalya in the autumn when all of its splendor shows itself. As summer turns to winter, the pulsating yellows and crimson of the Mediterranean sunsets become captured in the trees that line Antalya’s parks and boulevards as the leaves fall and carpet the roads and walks. In the late afternoon, the city erupts into a blaze of amber and ruby. Fall in Antalya is the time and place to experience all of the vibrant hues, tints, flavors and taste nature offers.